Have you Heard of Dementia Friendly Purple Table Reservations? I just learned about the Purple Table Reservations program and was beyond excited to learn and share with my readers. 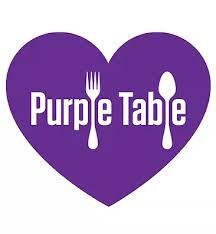 The Purple Table Reservation flag and restaurant training program are designed for those who are living with Dementia/Alzheimer’s Disease, Autism, PTSD, TBI, a hearing or vision impairment, or other physical or cognitive condition that may benefit from a more predictable environment and additional accommodations when dining out. When making a Purple Table reservation, you may provide the restaurant with further details. However no further detail is necessary, a Purple Table reservation is all that is needed. Families will know that when they make a Purple Table reservation at a participating restaurant, the restaurant and staff will go above and beyond to make your dining out experience enjoyable and successful. They will provide the accommodations that work best, along with a little extra patience and attention from staff who have been trained to understand different needs and how to best try and accommodate. Going out to lunch or dinner at a restaurant should be a lovely and relaxing experience. It is something to look forward to, and many of us take the experience for granted. However, many choose not to go out to eat because for themselves or someone they love it will be a challenging experience. We wanted to change this. Purple Table Reservations will change this. Embrace the Community. A little extra patience goes a long way. Hats off to the creative and caring folks at Purple Table Reservations!